Anytime we play Gonzaga in any sport it’s worth watching, so I headed out to the rainy, windy UP campus this afternoon to watch our Men’s Tennis Team open WCC play with 4-3 win over the Zags. Gross continued, “We will take the lessons from these tough matches and apply them in practice to become better. Plus, we surely will have close matches later in the season and this experience will help us when those come up." In the midst of a five match winning streak, the Pilots conclude their six match homestand on Thursday as UC Irvine comes to Portland for an 11 a.m. match. At least there’s still a cross-town rivalry in something! The Portland Pilots men’s tennis team snapped a two match losing streak with a convincing 6-1 victory over cross town rival, Portland State, Saturday morning at the Louisiana-Pacific Tennis Center. Portland’s doubles streak continued in the victory as the Pilots have won ten straight doubles team points. With the victory, the Pilots improve to 8-2 on the year while dropping Portland State to 2-10. The Pilots continue their homestand on Monday with a 9:00 a.m. match against Weber State, which will play Portland State on Sunday. It will be the third match in as many days for the Wildcats and the third in four days for the Pilots. What? Is Monday a holiday or something? Both UP and Weber State are on Spring Break so neither needs to worry about missing classes. Almost half of the Men's team stopped by and watched parts of the Women's match this afternoon/evening/night. Glad to see the student-athletes show up to support each other even after participating in a long match. Recap of the Women's match to come in the morning/afternoon. I was also surprised by the early scheduled time and a suggested idea was the local tennis academy might be using the LPTC for practice. The Portland Pilots men’s tennis team won the doubles point for the 12th straight match and the top four singles positions recorded victories en route to a 5-2 favorable outcome for the Pilots Sunday at the Louisiana-Pacific Tennis Center against the Montana Grizzlies. Portland ups its record to 10-2 with the win. With a 9-1 home record, they now head back into WCC play after beating Gonzaga over a month ago in their only WCC action to date. Portland is at home this coming weekend against San Diego and Saint Mary’s, Friday (10:30 am) and Sunday (10 am). In 5A boys, Paxton Deuel of Summit is the prohibitive favorite to take down his second consecutive state title. Deuel is the top-ranked USTA player in Oregon, and has signed with the University of Portland. Another fine recruit heading to UP in late summer. Vancouver’s Skyview tennis player Kent Andreasen made a significant change this year, shifting from a two-handed backhand to a one-handed stroke. One thing, however, did not change — his results. For the third time in his high school career, Andreasen won the district tennis championship. 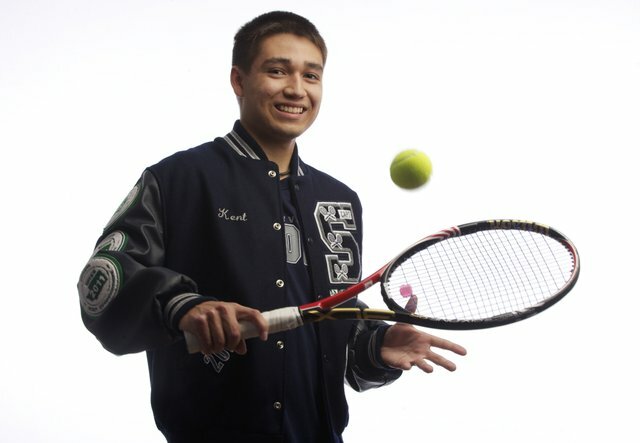 The senior also finished second in the regional and state finals, making him The Columbian’s All-Region boys tennis player of the year for a second consecutive year. Andreasen lost just two singles matches all year — both to Federal Way’s Mitch Stewart in the aforementioned finals. His prowess was impressive enough to earn him a scholarship to the University of Portland, where he will attend next fall.